SKU: 810622. Listed in: Costumes, Costumes Adult, Female, Halloween. 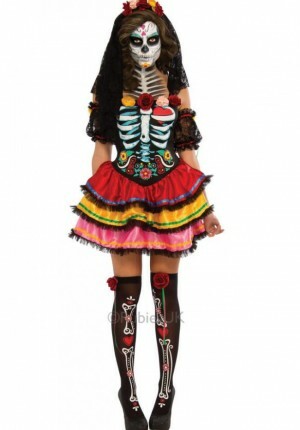 Tags: costume, dayofthedead, halloween, soiree, voodoo. Voodoo Soiree Costume day of the dead for purchase. Celebrate The Day Of The Dead As They Do Down Mexico Way! This Halloween Señorita With Her Tiered Skirt, Lace Trim And Fancy Printed Tights Is Much More Than Mere Skin And Bones. Time For A Moondance.